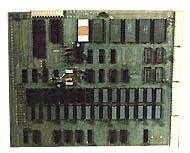 This board was used as a motherboard for the Challenger II. 500-1: Fully enclosed board with power supply, reset switch and two standard terminal connectors. 500-8: A 500 board in an eight slot Challenger case with power supply. see more OHIO Scientific MODEL 500 Ebay auctions !